Good stuff Max, thanks for sharing those photos. I very much agree about the “strongest” and “widest” claims. Even if it’s technically true, it holds no value at all. Would you care to share your personal wind speed ranges? Also, just one thing. Tim was actually driving one of the mobile mesonet vehicles, a Chevy Cobalt. Apparently someone else (maybe Tony Laubach?) was in their box truck further northwest. Oh, I knew Tim wasn’t in his normal chase vehicle but was still under the impression it was a truck. As for my wind speed ranges, do you mean in regards to my version of the EF-scale? There’s certainly overlap but I’d say EF4 tornado damage is associated with winds between 220 and 260mph, and EF5 damage is associated with winds in excess of 260mph. This wouldn’t be the same with the F-Scale due to the less stringent restrictions imposed before 2000. The worst damage from the El Reno tornado was right beneath where the doppler velocities were recorded (I walked a half mile out into the fields) and just south of the OKC West Livestock complex. I am wondering if you can elaborate on why you think that the Enhanced Fujita scale underestimates wind speeds in violent tornadoes. My understanding is that the original Fujita scale gave wind estimates based on straight-line winds, as opposed to cyclonic winds (which would be more appropriate), thus overestimating the intensities of violent tornadoes. The EF scale took cyclonic winds into account and therefore lowered the wind estimates to more accurately reflect the actual wind speeds necessary to cause the damage that is left behind. Many other people have made the same claim that the EF scale is too inaccurate, but the revisions make sense to me. I’ve just never heard what the other side of the argument is. John – I’ll have to seriously condense my argument, but my main reason for believing the EF-Scale underestimates wind speeds in violent tornadoes is that every single surface wind measurement that has been taken within a tornado has been significantly higher than what would be expected from the damage using the EF-Scale. For instance, a gust of 151mph was measured on the ground in the 2011 El Reno tornado near the EF2 damage contour, whereas much, much more intense damage occurred near the center of the storm. 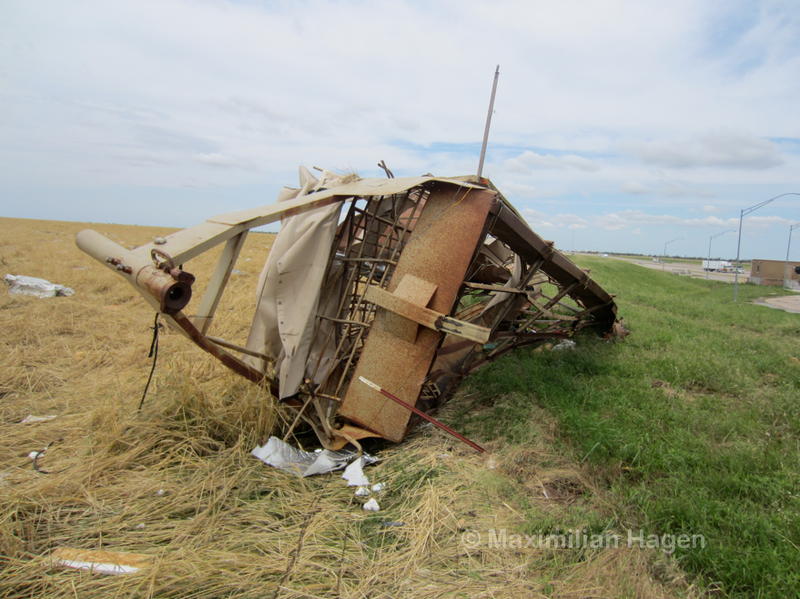 This year, the TIV2 recorded wind gusts of 175mph before the anemometer failed. The winds appeared to increase significantly following the failure, I’d imagine to a little over 200mph, and remained at that strength for nearly two minutes. Following the Jarrell tornado in 1997, some tried to say that winds of 160mph could have caused the catastrophic damage over the course of three minutes. 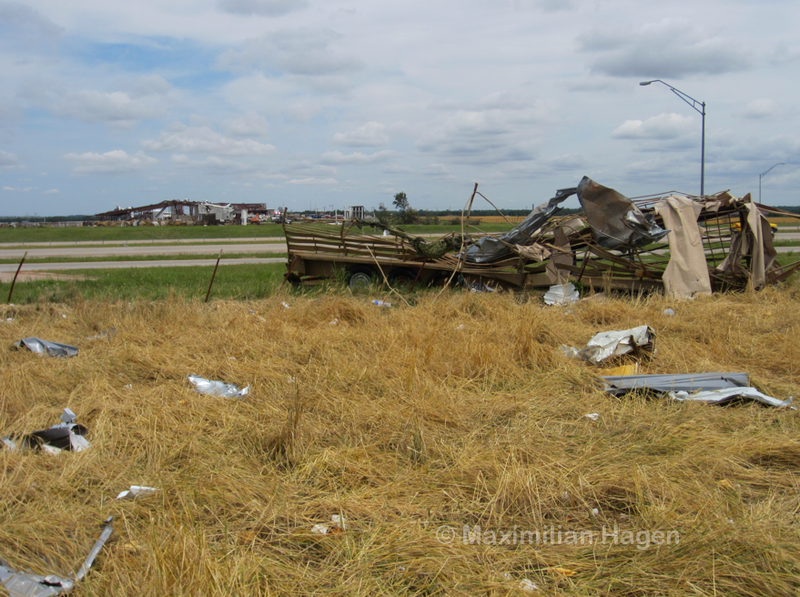 Yet the winds around the TIV2 didn’t cause any sort of ground scouring and were probably capable of causing low-end EF3 damage, much like the areas in Joplin unaffected by suction vortices. In turn, doppler velocities have almost always been more consistent with the wind ranges in the original F-Scale. And hurricanes never cause debarking or any of the other “extreme” damage indicators common in intense tornadoes. While the differences in wind direction, acceleration and debris load are significant, the fact that 200mph wind gusts over a long time frame (Hurricane Andrew, Cyclone Zoe) failed to cause any of these incredible phenomena indicate, in my mind, that tornadic winds are significantly stronger. If, in fact, 160mph tornadic winds can scour homes, roads and the ground to a depth of 18″ (Jarrell) then it is futile to compare tornadic winds to any other type of high wind event as their unique properties result in damage that could barely be attained by straight-line winds in excess of 300mph. If this is the case, then using the “mph” system should be abolished with tornadoes as it creates a false sense of comparability. I see your point, but I’m still not sure why this matters. The EF-Scale ranks a tornado’s intensity based on the damage it causes. 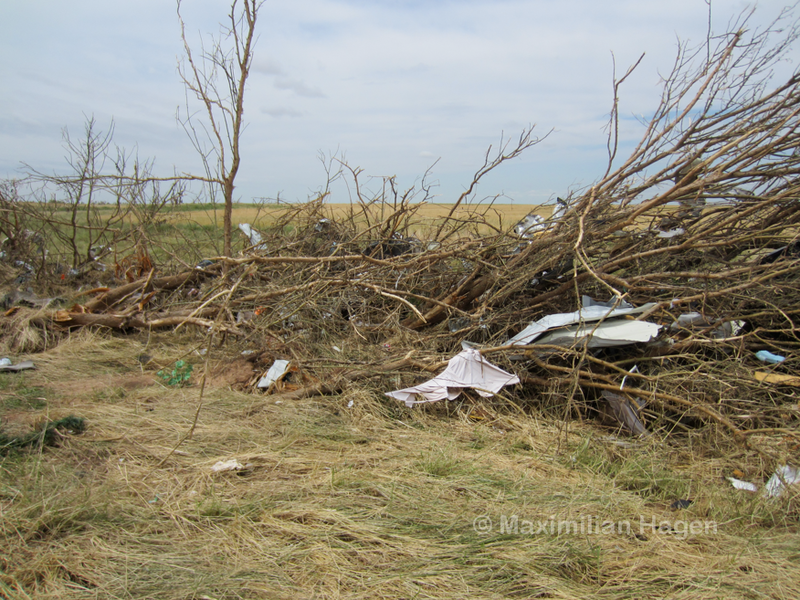 Wind estimates are used to determine the degrees of damage for each damage indicator, but even if the wind estimates were completely off, the methods used are standardized meaning they should be off by the same amount for each tornado analyzed. If I am correct about this then the accuracy of the wind estimates don’t actually matter (as long as they are consistent). If you equate the intensity of a tornado with the damage it inflicts (as the EF-Scale does), then it shouldn’t matter what the actual wind speeds are. Yes, I think there is ample evidence that the wind estimates in the EF-Scale are lower than they should be, but what I am wondering is: why is that an issue? You can argue whether a tornado requires winds of 140mph or 200mph to rip the roof off of a house, but survey teams looking at the house will classify the tornado as an EF3 either way. Now, I think your article on the Tuscaloosa tornado is interesting because it clearly shows how two different survey teams can come up with different EF ratings for the same damage. Here is where I think the EF-Scale is still lacking. Degrees of damage for each indicator is still based on one’s perspective on just how extensive the damage is. What exactly constitutes a home of “superior construction”? However, I don’t think the original F-Scale has the upper hand here because some homes are more solid than others. It had to be the case that the F-Scale was overestimating the intensities of some tornadoes. I think the EF-Scale is on the right track, but it’s not perfect. But human error and vague damage indicators aside, I’m still unsure why there is so much mistrust associated with it. Forgot to mention- regarding ground scouring, my understanding is that there is no determined relationship between scouring and wind speed, and that scouring is likely the result of debris sand-blasting the ground. If this is the case, then you wouldn’t expect ground scouring in either the TIV2 tornado intercept or the El Reno 2013 tornado since there was little debris in both events. Also, I wouldn’t think that the EF-Scale is comparable to other high wind events anyway since those are based on precise wind measurements whereas the EF-Scale is primarily based on damage (I am concerned about the El Reno 2013 rating since it was derived by radar measurements- this is where problems with the EF-Scale wind estimates would be applicable). I agree with you when you say the winds “don’t really matter.” I also believe the EF-Scale is a large improvement over the F-scale. In the case of the El Reno tornado, however, it was rated an EF5 solely due to doppler velocities. Until the NWS has a better understanding of exactly how the doppler velocities equate to surface winds, I don’t think they should rate a tornado an EF-5 based on doppler velocities (or if they do, be consistent about it). 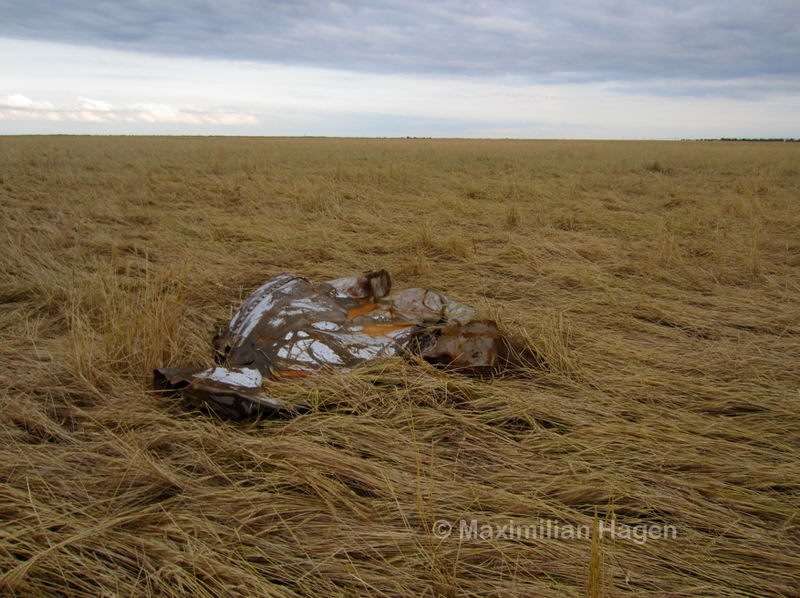 I’m waiting for the CSWR to release more information on their observations. And having surveyed nearly a dozen violent tornadoes, I can say with extreme confidence that ground scouring is not the result of debris impacts. 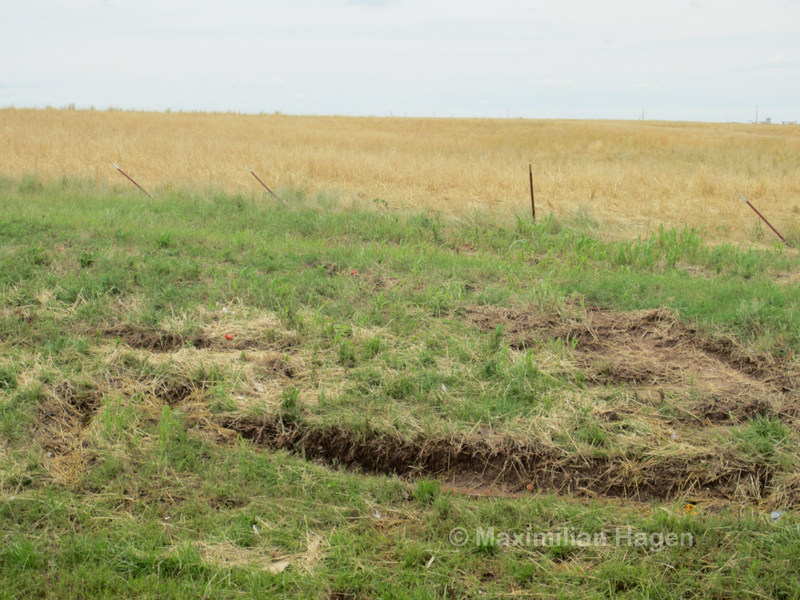 Maybe sandblasting plays a part, but ground scouring occurs regularly in the exact same conditions I photographed in El Reno. Generally the more rural an area the more intense the ground scouring, whereas plenty of houses and buildings slow the surface winds and reduce ground scouring. I have also found ground scouring and tree damage to be the most reliable indicators of tornado intensity other than damage to well-built homes. I mention in another post that ground scouring does seem to happen more readily in some areas (Oklahoma City/El Reno area being especially vulnerable to scouring) but many surveyors, such as Marshall, refuse to give an EF5 rating unless there is scouring/extreme tree damage. I strongly agree. John, regarding what constitutes a home of “superior construction,” It seems surveyors have differing ideas what qualifies as the minimum, but ideally a home would have anchor bolts with adequately wide washers spaced evenly at least every few feet and embedded at least seven inches into the foundation, as well as hurricane straps and that sorta thing. Just as important is the surrounding context — ground scouring, low-lying shrubs debarked/shredded, etc.I don’t think ground scouring by itself is evidence of an EF5 tornado, but it’s very likely an indicator of EF4+. Max, while we don’t know exactly how those winds translate, everything I’ve read and been told indicates max velocities aren’t significantly different at 10m than at, say, 50 or 100m. It seems the structure and duration of the maximum winds are more sensitive to height than the max velocity. RaXPol also found velocities of 125+ m/s on all tilts down to 0 deg. I think we need more research, but I think mobile radar velocities are as reliable (and probably moreso) than damage. Shawn – If this tornado had passed over a grid of well-built homes and failed to leave any EF5 indicators (which I think would have been the case, though I think high-end EF4 damage would have occurred) the doppler velocities should come second to the actual damage. Like I said, I was surprised to see the El Reno tornado caused less intense damage than the 2013 Moore tornado. 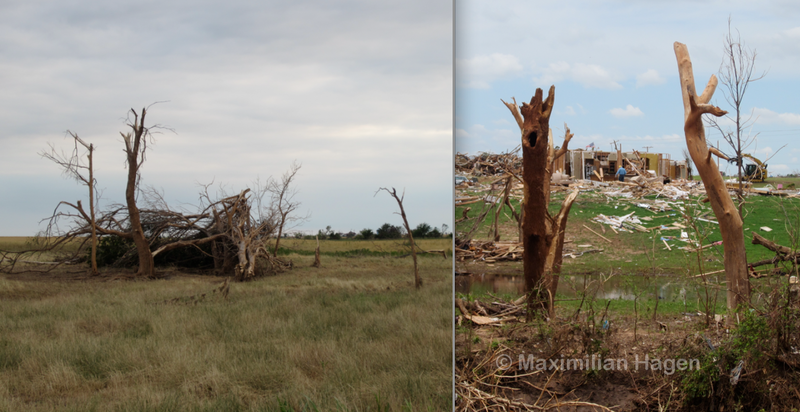 Both tornadoes passed over similar vegetation in rural areas. Nice job, Max. Good, solid, well-written journalism. Amazing article, EP. I’ve been anxiously awaiting your survey pics from the El Reno tornado. I am surprised you didn’t find more intense ground scarring. 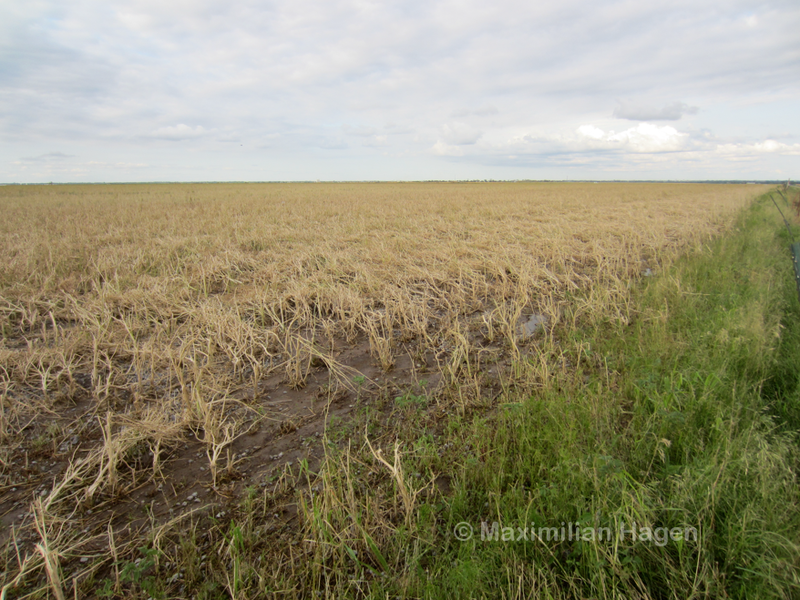 I imagined the fields would have been completely stripped bare. I sent you an email to see if I could see some more photos from your survey. I don’t see an e-mail from you, but it’s extremeplanetmax@gmail.com. I took well over 4,000 pictures in El Reno and Moore so I have plenty to show, just let me know where/what you want to see. Fascinating analysis, this and all of your articles. I’ve spent the past two days reviewing all of your work. I’ve subscribed. Excellent analysis – I’d have to agree that I didn’t see any really intense EF5-level damage even in the most intense part of the tornado; I also heartiy agree that the EF scale vastly underestimates wind speed. Perhaps the original F scale was closer to the correct speeds for higher categories? I’d like to see more tornadoes measured to compare this one with others. I think the original F-Scale was almost spot-on, actually. The doppler velocities recorded in violent tornadoes during the 90’s (Spencer SD, Bridge Creek OK, Dimmitt TX, Mulhall OK) correlated almost perfectly with the original F-scales wind ranges. Oftentimes, they were even a bit higher than would be expected. This tornado was rated a high-end F3 on the original Fujita scale. http://tornadostormshelters.com/Westminster.htm. Based on the ground scouring associated with this tornado do you think it could have easily been rated at least an F4 on the original F-scale or even EF4 on the EF-scale. The damage photos from this tornado seem to be even more impressive than the ground scouring done in the El Reno tornado. 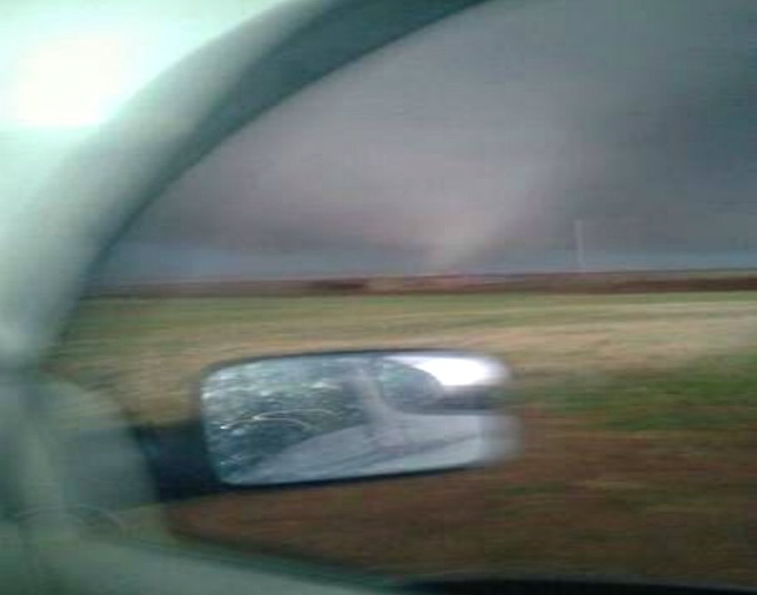 Shane – I talk a bit about the Westminster tornado in another post. Had I surveyed the damage myself I would have gone with an F5 rating based on the severe ground scouring, large homes swept completely away and vehicles mangled beyond recognition and thrown over 200 yards. The Westminster tornado was definitely stronger than the El Reno tornado, IMO, and probably comparable to the 2013 Moore tornado. 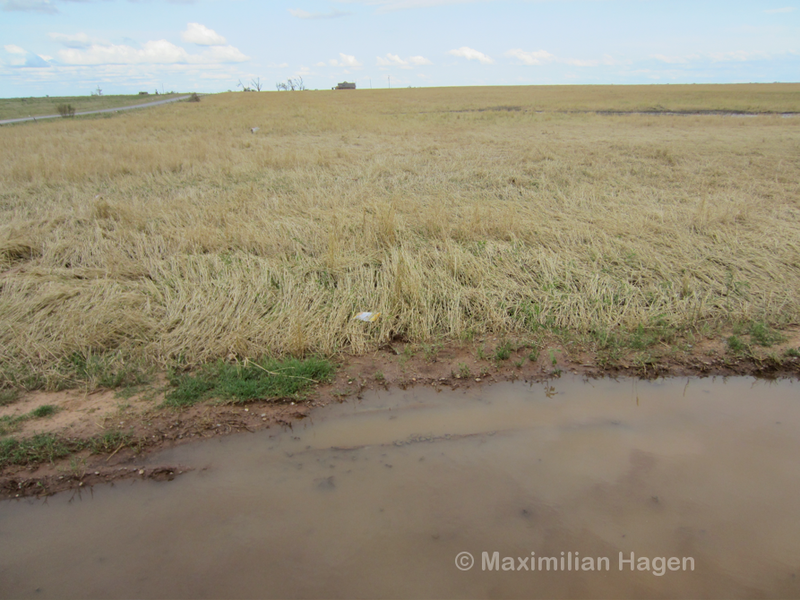 Max, do you factor in soil type when you consider scouring? 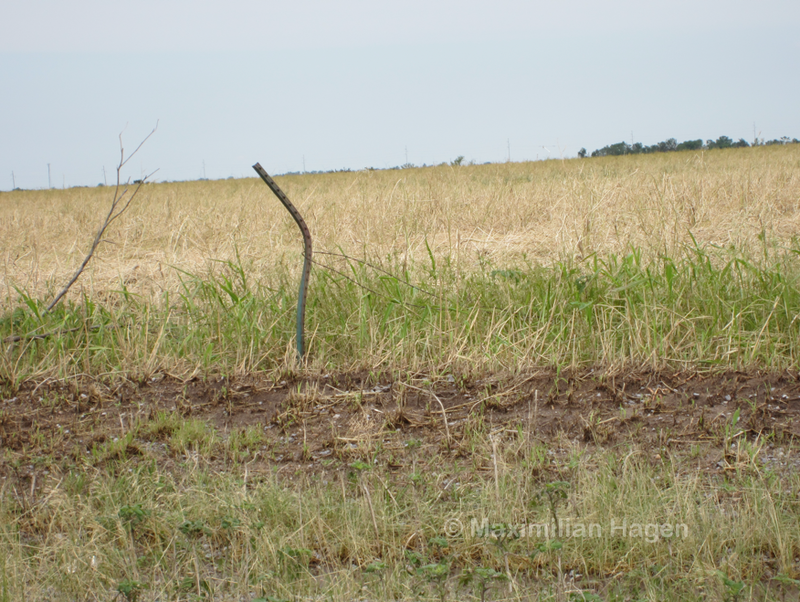 Scouring seems to happen more readily in central Oklahoma, for example, where the soil tends to be loamy and often a little more loosely packed. I think it’s generally still an indication of a violent tornado, but it’s got to take less to scour that sort of soil compared to heavy, densely packed soil. 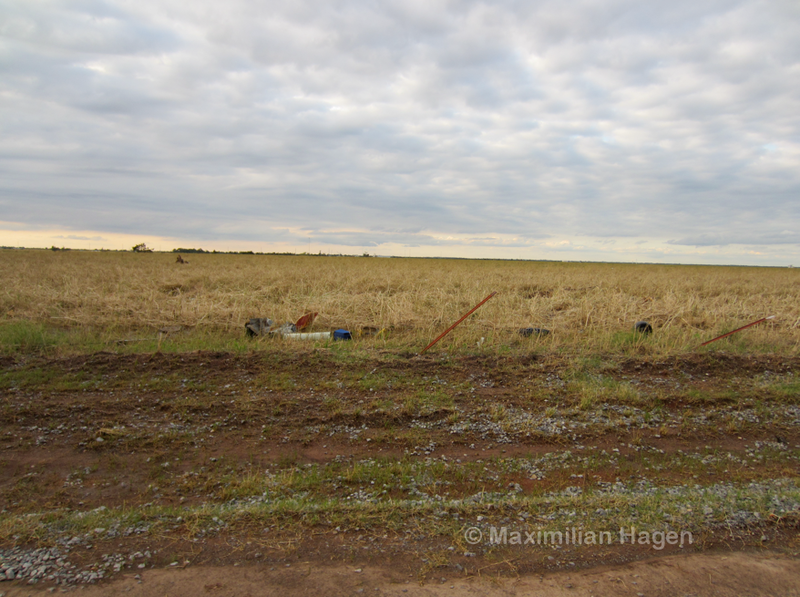 If memory serves (it often doesn’t), I think the soil in the blackland prairie area is mostly tough, compacted clay. That’d certainly lend credence to Westminster being a high-end tornado. I don’t think there is any standardized way of factoring in soil type being that the ground composition can vary significantly within a single square mile, and month to month based on precipitation. 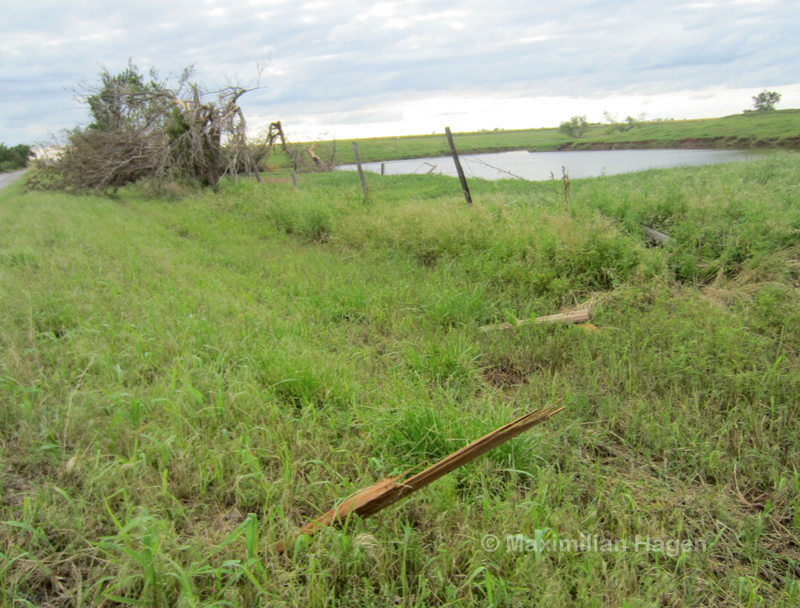 I have noticed scouring appears to occur more frequently in sections of the Great Plains, but the vegetation and slower forward speed of the tornadoes may be the primary factors. I always believed the Westminster tornado was definitely much stronger than the rating it was given. The ground scouring reminds me not only of the recent Moore tornado but also the ground scouring done in the Bridge Creek/Moore/OKC tornado from 1999. Of course I think the Westminster tornado was on a smaller scale and that was because it was not quite as wide as them two tornadoes and it also went through more rural area. It also seemed definitely stronger than the recent north Texas EF4 tornado in Granbury. I honestly would have went at least with a solid F4 rating for the Westminster tornado and like you said an F5 rating doesn’t seem out of the question. Sorry to bother you again but I wanted to let you see a youtube video in regards to the Westminster tornado. The reporter is standing on a SLAB OF CONCRETE of which used to be a fairly good sized home. The whole house was completely swept away and even some of the fixtures looked like they were torn off. IMO this tornado was one of the most grossly underrated tornadoes I have ever heard of. Here is the video. http://www.youtube.com/watch?v=_uVqSJoTuIY. If that house doesn’t qualify for at least an F4 rating then I don’t know what does. This is such excellent reporting and analysis. It was horrifying to read as you unfolded the story, knowing the fatalities. 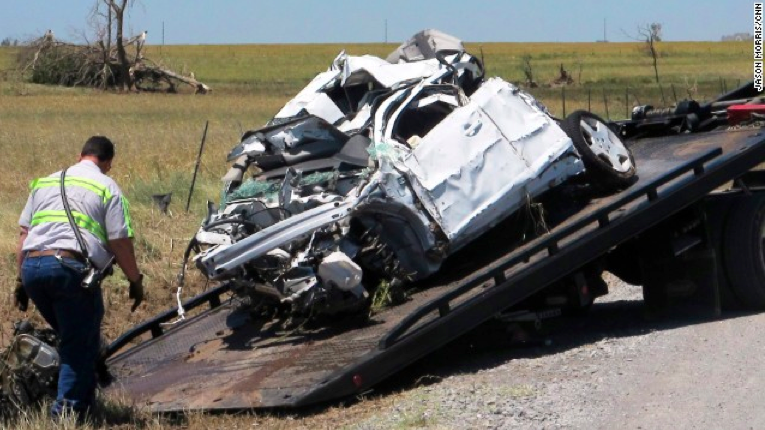 When you look at the vehicle that was carrying Tim Samara’s and the other two storm chasers, what kind of winds would you estimate it would take to do that to a car? The car does look very bad off but it does not appear to be destroyed beyond recognition. I would estimate myself to be at least EF3 but that is only my guess. I would guess that winds of 190mph with a decent upward component could have caused that damage. Do you think this tornado would have done EF5 damage had it hit OKC dead on? Shane – No, I don’t think it would have caused EF5 damage. More likely a wide area of EF1/EF2 damage and streaks of EF3/EF4 damage. I was reading Max how you believe the EF-scale underestimates the winds associated with violent tornadoes and you believe the F-scale is almost right on. I do tend to wonder that myself. Lets just say that EF-scale is correct with wind speeds associated with violent tornadoes. The DOW clocked winds at 295mph at about 400-500ft above the ground. Could it be possible that the winds at the surface may have been much weaker than those clocked several hundreds of feet above the ground? I know the Bridge Creek/Moore/OKC tornado had winds clocked at 318mph some distance above the ground and it did do intense F5 damage in a number of areas. That tornado had winds pretty consistent above the ground as it did at the surface. Is it possible that some tornadoes may have a big difference in winds clocked above the ground than winds at the surface like this El Reno tornado? While some tornadoes may have very little difference in wind speeds above the ground or at the surface. I don’t know much about this being possible but maybe you can answer. There really isn’t enough information to know as surface readings in tornadoes are almost non-existant – particularly since the winds in tornadoes vary widely due to subvortices and other wind features. I believe, however, that the winds in tornadoes follow the same general principles as hurricanes. This would mean that for most tornadoes, the winds at the surface are a bit less intense than the peak winds between 100 and 500ft. With especially strong hurricanes, however, the maximum winds reach all the way to the surface, and sometimes even exceed flight level winds. If this were the case in tornadoes, then the surface winds in EF5’s could be every bit as strong as they are higher up. But it’s a lot more complex than that. In some tornadoes there might be transient vortices that bring extreme winds to the surface for only a few seconds. Others might have vortices that develop in other parts of the funnel that fail to reach the ground (as may have been the case in El Reno). I know this an extremely unlikely case scenario and might even be next to impossible. I believe a funnel cloud must make contact with the ground in order for it to be classified as a tornado. If a funnel cloud went over the top of a large skyscraper and did significant structural deformation to the top of the building but failed to make contact with the ground what would it be considered. I know very little about tornado formation and tend to wonder if its even possible. If it caused damage it would be a tornado. And if damaging winds were to get down to within 1,000ft of the surface then there would certainly be some winds on the ground as well. 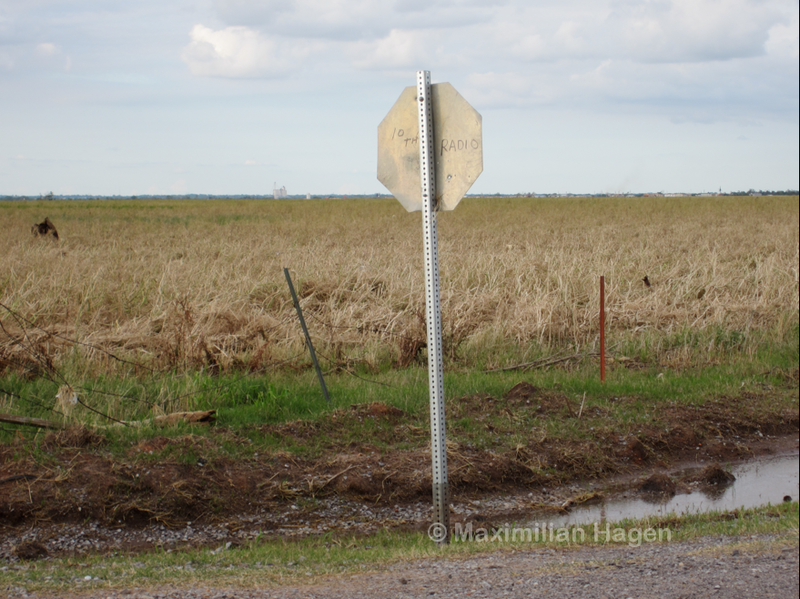 What about the Rozel and Bennington, Kansas tornadoes? Those two tornadoes were upgraded to EF4 based on the DOW. The one where was another tornado you described where Sean Casey used some kind of instruments that measured 175mph wind gusts before being destroyed. You claimed it may have gotten a little bit stronger than that though. That tornado was never upgraded it remained an EF3. 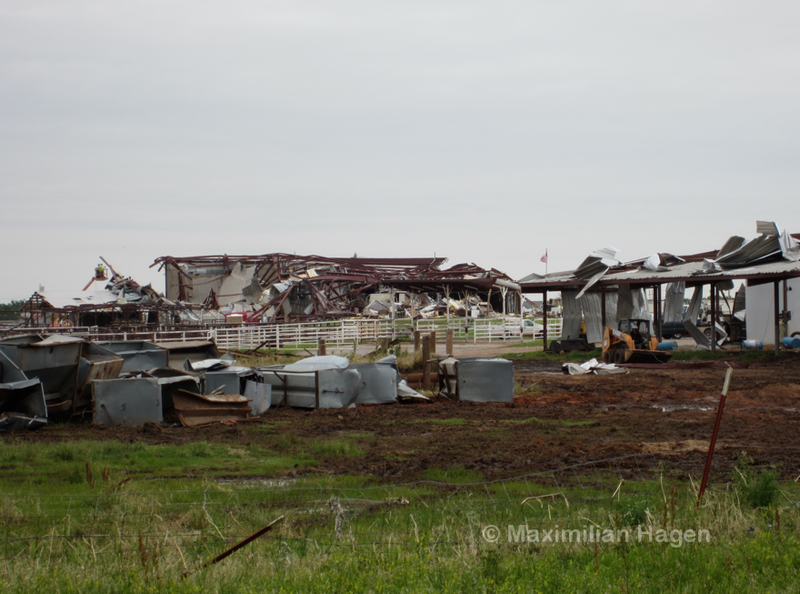 The Rozel tornado did not seem that impressive as far as the damage goes to indicate an EF4 but the Bennington tornado may have indicated EF4 intensity. I could be wrong about the Rozel and Bennington tornado but I don’t see anything that was that impressive damage or ground scouring wise. I haven’t done much research on those tornadoes so I haven’t formed a strong opinion, but I do believe the TIVII probably encountered winds near 200mph – or, assuming the instrument failed at peak wind intensity, 175mph winds for a solid 90 seconds. Considering that the vertical component of tornadic winds are not captured by traditional anemometers (as they hit the wind cups diagonally), the 175mph reading may have been closer to 190mph or a bit more at the time of failure. I don’t believe the NWS is going to downgrade the rating on this tornado. They seem to be way to overly impressed with the size and wind speeds recorded in this tornado. You said this tornado was probably capable of causing solid EF4 damage at most. Although you don’t believe it would have caused EF5 damage, do you think it would have killed a lot of people had it of hit a rush hour traffic bridge and would have went through the OKC metro? Of course. Considering the fatality rate in the few vehicles impacted directly by the storm, I’m sure hundreds would have died on congested freeways. I don’t know if it is me or my lack of knowledge but so many things about this tornado make no sense. Not only did it have a very incredible width, it had some of the most insane radar velocities ever observed and some of the most extreme wind speeds ever clocked inside a tornado. This tornado may have stayed over the same area of land for over 5 minutes and failed to do any kind of damage that was extremely impressive. I would have expected a tornado like this to have done ground scouring very similar to the Jarrell or Harper tornado. If there really is such thing as E/F5 ground scouring the Jarrell and Harper tornado would take the cake. It looks literally like a large blow torch went across the ground. They leave burn marks, scar marks, and spiral marks all over the ground. Do you think the El Reno tornado failed to do this because the suction vortices were not touching the ground or something else that may have prevented it. I don’t know if it is because 2+ mile wide tornadoes may not be the strongest but I am not really sure about that either. The Mulhall tornado on May 3, 1999 was believed to have been possibly 3 to 4 miles wide and capable of doing a mile-wide continuous streak of E/F4+ damage. You have any thoughts on why this tornado failed to do some type of EF5 damage criteria Max. I find it very confusing as well. 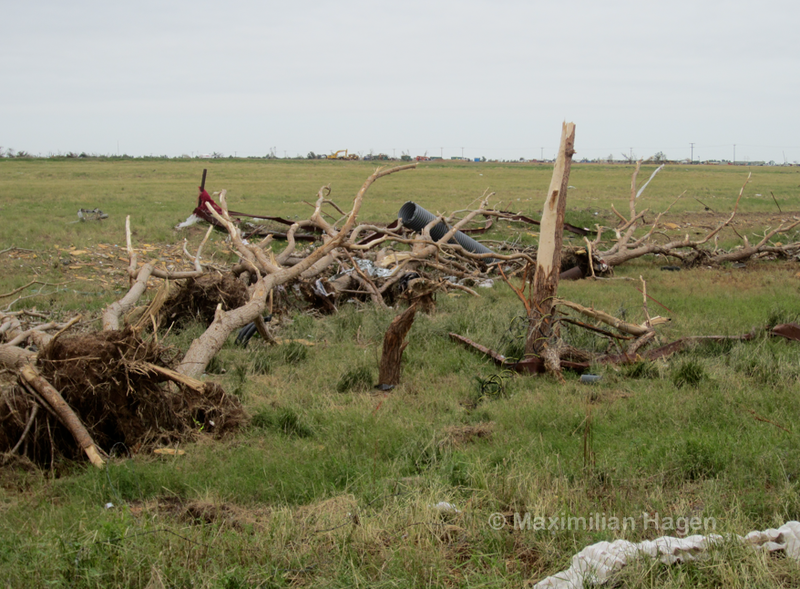 While some comparisons are drawn between this and the Mulhall tornado, the Mulhall tornado caused EF2 to near-EF4 damage in the town of Mulhall, which was one mile away from the center of the tornado on the weaker left side of the storm. This tornado passed over two dozen homes scattered rather evenly throughout the tornado’s path, even in areas near where the highest winds occurred, and yet only caused high-end EF2 damage in areas east of the 81 and south of the freeway. The worst damage, even more strangely, occurred west of the 81 and north of the freeway, where the tornado was supposed to be weaker. I can’t say I understand why this occurred. Part of me believes, like you said, that the most extreme winds in the vortices (greater than 220mph on my scale) failed to reach within 10m of the surface. I do agree with you that rating a tornado based on DOW readings does seem concerning. What if we still used the original Fujita scale and wind speeds were clocked at 350 mph? Would such a tornado be rated F6? I have heard from others such as NWS employees, that Fujita’s sole purpose was to be able to rate tornadoes based on winds alone instead of damage. Is this true? Another thing why wasn’t tornadoes in the 90s rated F5 based on DOW reading, such as Red Rock, Spencer, and Mulhall? I also like how you believe that extreme ground scouring and complete tree debarking should be used just as much as the construction of a home when determining a tornadoes rating. I do agree that extreme ground scouring and complete tree debarking is an indication of a at least E/F4 intensity. Also what happened in 2005 and 2006 that there were so few tornadoes rated F4? It made no sense. There were a total of 3 F4 rated events from those two years. There are at least 2 tornadoes that deserved at least an F4 rating and that was Stoughton, Wisconsin on August 18, 2005 and Westminster, Texas on May 9, 2006 and possibly a couple others. I don’t know if this had to do with what happened in La Plata or if it was some other reason. I know I am no expert on rating tornadoes, it seems as NWS offices have contradicted themselves when rating a tornado. They’ll use DOW readings to up grade a tornado but they will not use extreme ground scouring or complete tree debarking. Even if home damage is not that great or not superior, extreme ground scouring and complete tree debarking is a very good indication of a violent tornado. I don’t think there ever was an F6 rating, so it probably would not have ever been used. As for whether Fujita wanted the scale to be a wind scale alone, I’m not sure but it makes sense as that’s what was being done with hurricanes. Yet more research over the years has shown that winds in tornadoes are exceptionally complicated and the severity of the damage is impacted by more things than just the windspeed – such as duration, wind acceleration and upward velocity. Many surveyors will not even discuss ground scouring because there is no official DI for it. I have brought it up other places, and most meteorologists will discount it entirely. Irritating, because if anyone were to do several years of intense studying of historic and recent tornadic events, the link between ground scouring and high-end events is obvious. With that said, soil type must be taken into account. In central Oklahoma, pronounced scouring seems to begin in the EF4 range, due to the loose and dusty soil type there. 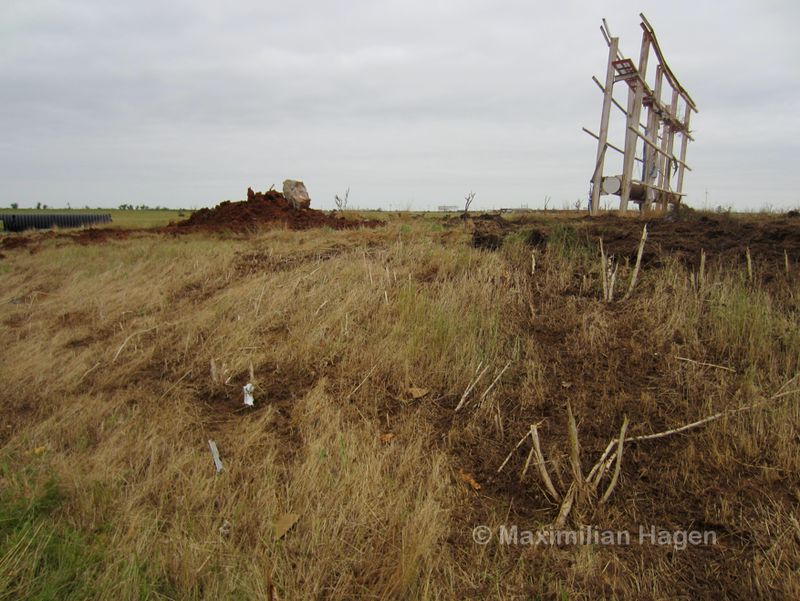 In the deep south, scouring seems to only begin well into the EF5 range, due to the dense, clay laden soil there. Interesting, considering I can’t think of a single EF3/F3 event besides Westminster that produced severe ground scouring. While some say ground scouring has no relevance in the rating system, the Philadelphia tornado was given an EF5 rating solely due to ground scouring. Home construction varies quite a bit more than the composition of vegetated fields throughout tornado alley and the South. Tim Marshall makes quite a point of examining ground scouring in his article on EF4/EF5 damage. 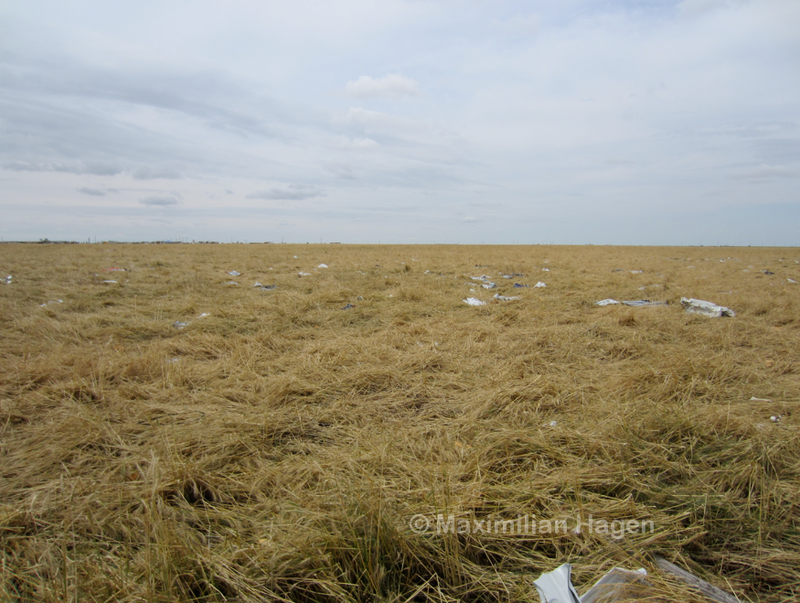 From my personal experience surveying damage paths and examining thousand of damage photographs, I would go ahead and say it is the ultimate indicator of a violent tornado – particularly if the fields are covered in grass or dense vegetation. I’ve also noticed that ground scouring is less tied to wind duration than other damage indicators, such as home damage. Ground scouring only begins to occur at extremely high wind speeds (unless the soil is loosely packed or some other variable is at work) and is therefore evidence of intense instantaneous wind gusts. After the May 3, 1999 Bridge Creek/Moore/OKC tornado there was a lot of debate whether or not it reached F6 status since winds were clocked in the upper range of an F5 which was like 318 mph + or – 20 mph. An F6 rating seems hypothetical because experts believed it would be nearly or next to impossible to distinguish between F5 and F6 damage. F5 Incredible tornado(261-318mph) and F6 Inconceivable tornado(319-379mph). Some experts believed that tornado winds could probably reach F6 status but like I said above would be rated E/F5 because it would be nearly or next to impossible to differentiate between the two categories. The only two tornadoes that may have come close to F6 damage is probably Jarrell, Texas and Sherman, Texas, your first ones on your list pre and post 1970. Those two tornadoes may have had instantaneous wind gusts of well over 300 mph. As far as the DOW readings go I believe Red Rock was 286 mph, Spencer, SD was 246-258 mph, and Mulhall was 277-299 mph. Some sources have Red Rock as 286 mph and others at 268 mph. Where did you get the Spencer, SD DOW reading as being 264 mph? I could not find that anywhere on the internet. Even though, those winds fall well into the F4 category and even midway into the F5 category on the original F-scale. Those winds go well into the EF5 category on the EF-scale which lists winds of over 200 mph but like you said I to tend to believe wind speeds are underestimated in violent tornadoes on the EF-scale. Do you also happen to know what winds were clocked in other tornadoes DOW readings such as Dimmitt, Texas, and Kellerville, Texas etc. As for the Red Rock reading, I know it wasn’t 286mph. I’m too lazy to do a fact check at the moment but 268mph sounds like what I remember. The Bridge Creek, El Reno ’13 and El Reno ’11 are the only tornadoes that have been recorded at or above 280mph. In my notes I have that the Dimmit, Texas, tornado was recorded with an overall peak rotational velocity of 168mph, but the article mentions that unresolved multiple vortex activity indicated a reading of 224mph (100 m/s) was more appropriate. buckeye05 – while some conservative surveyors and meteorologists consider ground scouring to be impossible to categorize, a large portion do take it seriously the way it should be. Long time surveyors and researchers like Marshall and Grazulis utilize ground scouring on a regular basis to either verify or disprove a high-end rating. Thank You Buckeye05. I totally agree with you on the ground scouring. Though I am not a meteorologist or engineer, I have been studying the F-scale and EF-scale very consistently over the past decade. I emailed Gary Woodall the guy who did the Westminster, Texas tornado survey a few years back. He told me that extreme ground scouring and complete debarking of trees does not guarantee a rating higher than E/F3. I highly disagree. 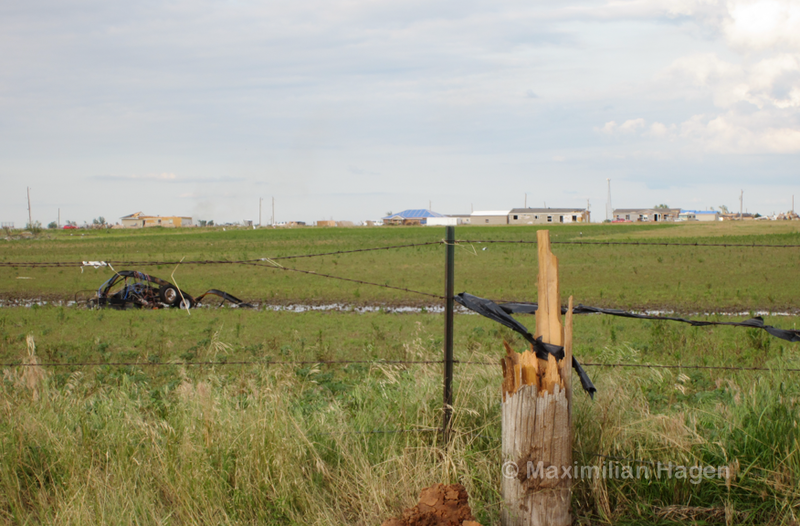 Then I mentioned the wadded up Honda and he told me that the Leighton tornado flipped cars with EF1-EF2 winds. Yeah it flipped cars over, but it did not wad them beyond recognition, rip their engine out, and wrap it around a tree. 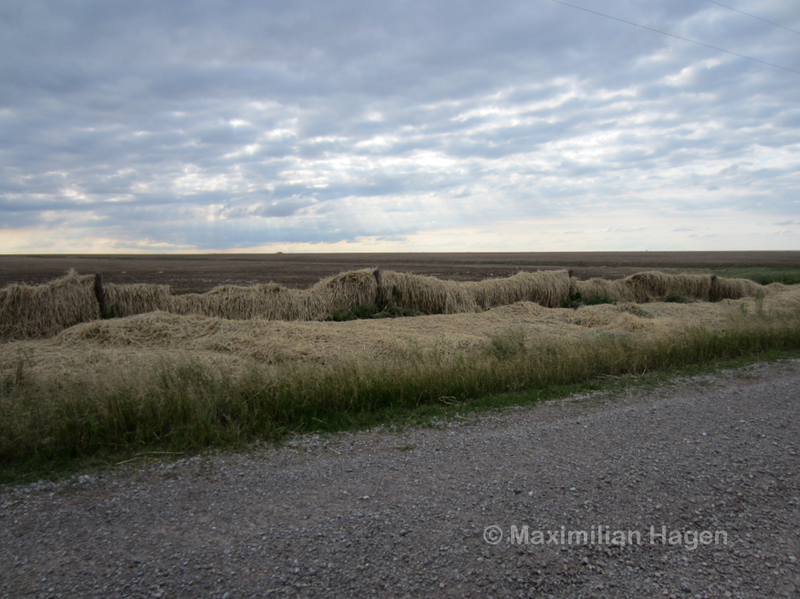 The Westminster tornado even partially debarked or completely low lying shrubs out of the ground. 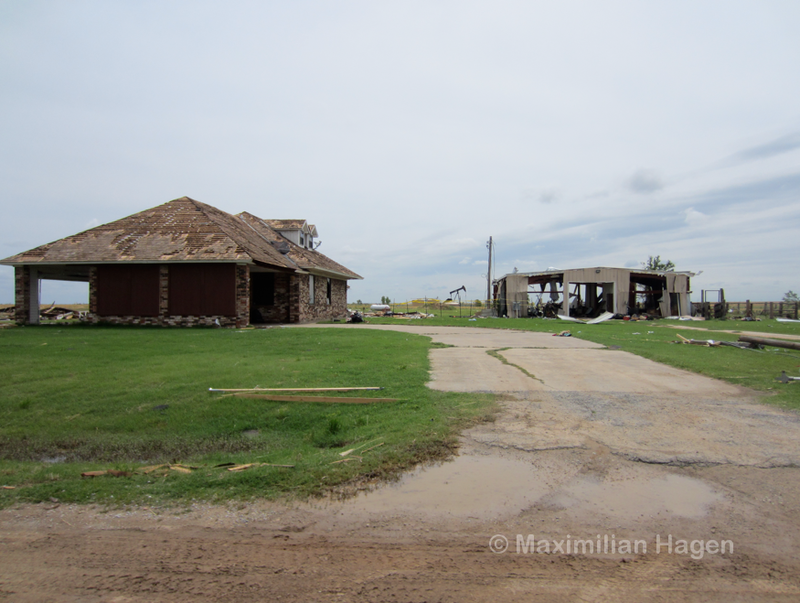 I did look a little bit into the Rozel, Kansas tornado and it did at most EF3 home damage. The DOW clocked winds at 165-185 mph at one point and it was upgraded to an EF4. The most intense damage was where a road was scoured and 1000 gallon propane tank was lifted off its foundation and lofted a quarter mile. That sounds pretty impressive but I wonder if the DOW was being used when that damage happened. I probably would agree with the EF4 rating based on that damage but not necessarily the DOW reading. 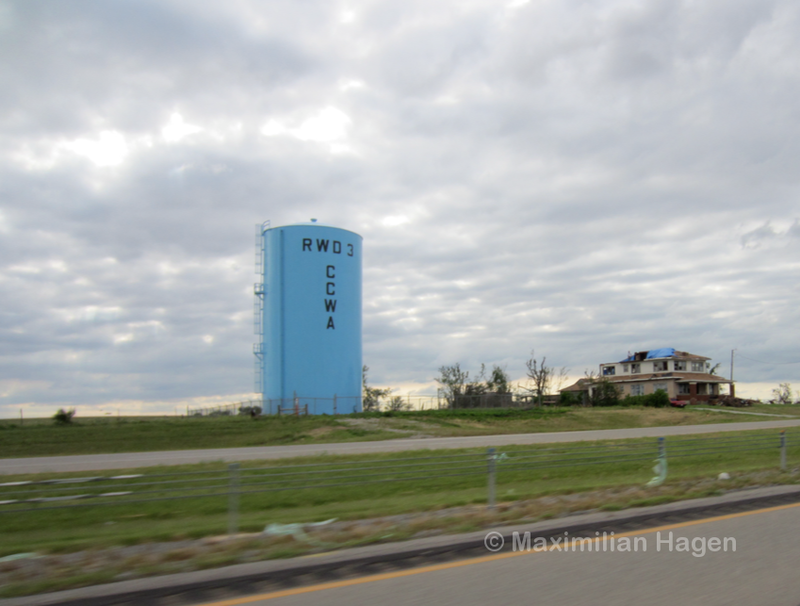 I am not sure what the official DOW reading that was measured for the Red Rock tornado. For years it was solely listed as 286mph but more recently it has been listed as 257-268mph and some articles still say 286mph. Just check those sites above one will list it as 286mph while the other will list it as 257-268mph. I don’t know which one is correct. Did you get the website articles I posted on this page of the DOW readings for the Red Rock tornado? Some articles state 286mph and others 257-268mph. Top 5 (or 10) list of instances of the most intense ground scouring ever, please! Or could either of yall point me to a scouring post? Jarrell, Smithville, Plainfield? I can’t think of the one with the black and white pics from a newspaper where they “calculated” winds of 400-500 mph or whatever it was, but those are crazy marks. Shawn posted pics of asphalt scouring at Pizza by Stout in his excellent Joplin post in Feb. That has to take some serious wind speed at ground level. I think Shawn posted a picture of the 1960 Charles City tornado on talkweather, if that’s what you’re referring to in regards to the old winds estimates over 400mph. 8. Beyond that it gets a lot more diffuse. How off were they with those wind estimates on the 1960 Charles City tornado? Would it be considered one of the worst F5’s of all time if its winds were estimated that high? I have heard very little about it. The estimates were off because they did not have a solid understanding of suction vortices and instead did a mathematical equation using the forward speed of the tornado in relation to the scouring marks as if they were caused by a single rolling object. The Charles City tornado would probably not have received an EF5 rating today based on the damage photos I have seen. It was quite a bit less intense than the 2008 Parkersburg tornado. Ha, yeah, Paul Waite and Clarence Lamoureaux calculated 528mph by using the basic equation V equals CNS, with C being circumference of the ellipses, N being number of rings per mile, and S being forward speed of the tornado. Needless to say, this particular technique proved rather ineffective. Incidentally, it returned an error when I tried to post the equation using the equals sign. Hmm. Awesome. The Philadelphia ground scouring photos are ridiculous. 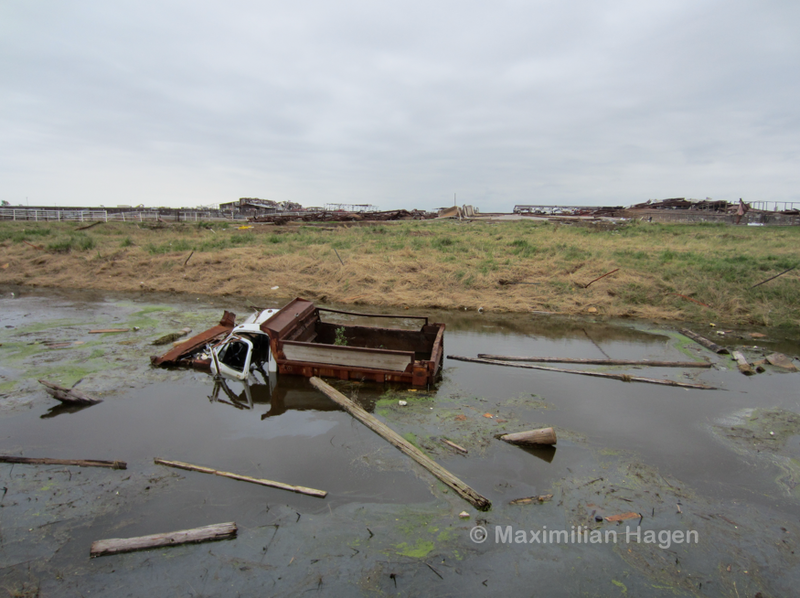 To think that moving air in a storm caused that… Yes, feel free to go ahead and make a full post on scouring. 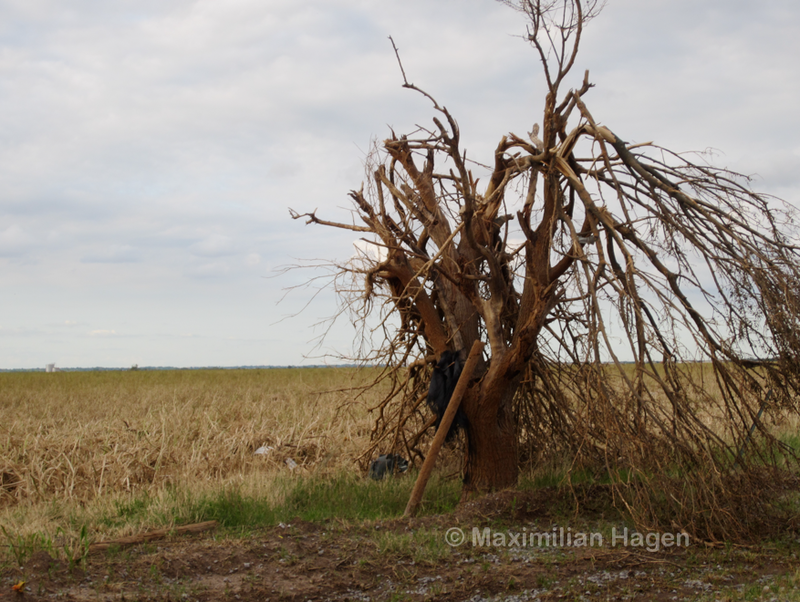 I can’t seem to find Lawrence Co damage survey pics other than the one with the partially debarked tree. And it’s at #4! 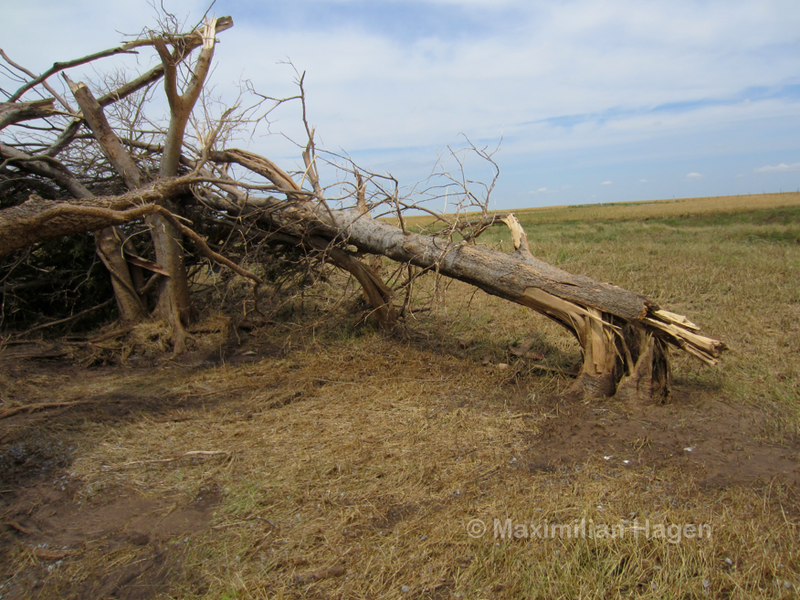 The Harper Kansas tornado on May 12, 2004 also had some of the most extreme ground scouring I have ever seen. It also produced some of the most extreme damage I have ever seen. One guy said he was more impressed with the Harper tornado damage than any damage he observed in Bridge Creek, OK on May 3, 1999. 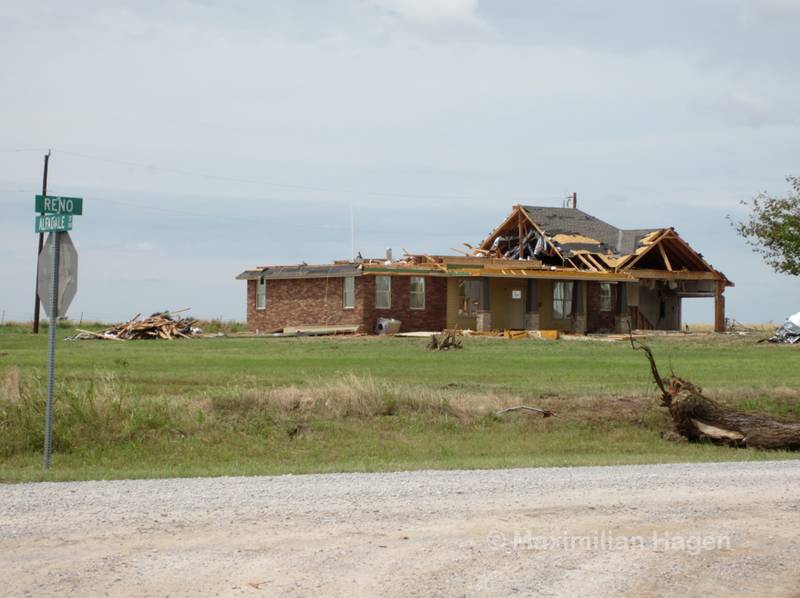 The Harper tornado damage was much like the Jarrell tornado damage except it was over a smaller area. Regarding Charles City, I did find a picture of an asphalt walkway scoured away, and a picture of a house reduced to an empty basement with the center support beam ripped from its supports. Seems like it may have been pretty violent, possibly marginal F5 imo. If the highest winds recorded were about 400-500 feet above the ground is it possible this tornado could have done EF5 damage to the top of a high skyscraper such as Devon Energy Tower in OKC. Once again I am not the most certain of this but maybe you can explain this Max. Well since winds near 300mph were recorded at those elevations, yes I think it is nearly certain that winds capable of causing EF5 damage were swirling around about 40 stories above the surface. It seems that someone in the NWS agrees that this tornado should not have been rated based on radar. What do you think about the fact that it was recently officially downgraded back to an EF3 tornado? I believe the downgrade was appropriate as that was the maximum damage the storm caused. I don’t know whether I agree or disagree with the downgrade. Too many things about this tornado made absolutely no sense. On the other hand it is too uncertain as whether or not this tornado was capable of inflicting EF5 damage. There are other events where the tornadoes were nearly as wide as this tornado and wondered if they carried near 300mph winds or were possibly capable of inflicting E/F5 damage. It makes me wonder if they were similar in ways to this tornado. The Yazoo City, MS tornado(1.75-2.00 miles wide), the Trousdale, Kansas tornado(2.25 miles wide) and the Hallam, NB tornado(2.50 miles wide). It makes me wonder if they carried very intense suction vortices that were incapable of making contact with the ground or did but it was only for a fraction of a second. Then on the other hand it is suspected the Pampa, TX tornado on June 8, 1995 and the tornado in North Dakota on August 7, 2010 you mentioned were probably capable of E/F5 damage, despite they were narrow or even drill-shaped. I’d agree with the downgrade, simply for the fact that it is uncertain if ground-level winds were actually capable of causing EF5 damage. I’d rather rate a tornado too low than too high. For considerations of intensity, I don’t think size should be given that much consideration. I agree with Nick, size should not be given much consideration. I think that extreme winds in tornadoes often occur in small vortices only 100 yards or so across – either as the entire tornado (Pampa) or suction spots within a larger funnel (Joplin). The overall size of a tornado says little about what’s inside of it. I agree with both of you that the size of a tornado does not matter when it comes to a tornadoes intensity, but you would think with a tornado that large(2+ miles wide) there would be plenty of small suction vortices that would be able to inflict EF5 damage. There were some people thinking just after this tornado in El Reno was downgraded to EF3 that the El Reno tornado from May 24, 2011 was going to be downgraded to EF4. Yeah they used DOW to upgrade the El Reno tornado on May 24, 2011 to EF5 but that tornado did some amazing things like EXTREME ground scouring, wadded several vehicles and made them look unrecognizable, and moving equipment that weighed 2 million pounds. The EF5 rating seemed very appropriate. I think surveyors get way too wrapped up in the construction of the houses and don’t consider other things you describe. I was wondering how you concluded that this tornado had it of passed over a row of well-built homes it would have caused mid to high-end EF4 damage. Isn’t high-end EF4 damage is when a well-built home has been destroyed in EF5 fashion but most of the debris remains nearby where the home once stood. EF5 I think is where all or nearly all the debris is swept completely away leaving little to no trace. Never mind. I just discovered something that busts the 4.3-mile width of the twister. It’s a blog post, but the guy who criticizes the news report is the man who made the study. It turns out the 4.3-mile width was talking about parent circulation, not the twister itself. The news report that made the mistake is right here if you’re wanting to take a look at it. Ha, I just responded to your other posting. Ya, I didn’t think that “upgraded” width seemed accurate. The visible damage path, based on my own fairly meticulous two day survey, was almost exactly 2.5 miles wide at its widest. Never heard about the El Reno tornado being 4.3 miles wide until now. It sounds absurd but even if for some reason it was 4.3 miles wide does that necessarily mean EF5 strength/damage. I swear a lot of people who know about the F-scale or EF-scale still seem to automatically associate an extremely large tornado as an EF5 tornado. I tend to believe though typically F5/EF5 tornadoes are usually pretty large. Although this is typical of F5/EF5 tornadoes, most of the F5/EF5 damage is typically more narrow than the tornado itself. I am not saying a colossus sized tornado would be incapable of producing EF5 damage but it is likely the EF5 damage would still be confined to a pretty small narrow area. What if one of these days a 30 yard wide EF5 tornado ends up drilling 4 or 5 feet into the ground and dislodging homes and their foundations. 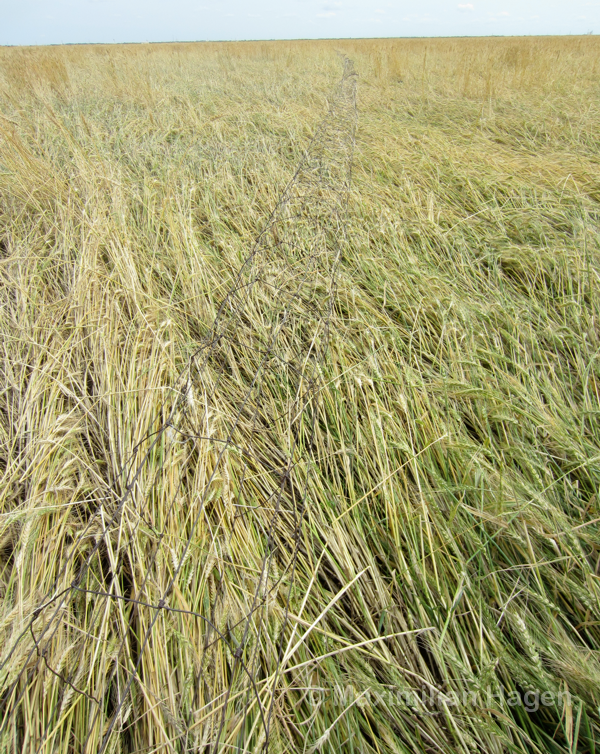 Lets say the narrow streak damage ends up being stronger than the Jarrell tornado. Are we going to be disappointed this tornado was a small rope instead of a huge wedge? I haven’t seen too much debate regarding size vs intensity, but of course you’re right. While there is a definite relationship between size and intensity, as well as path length vs intensity, both are correlational as opposed to causal. The Philadelphia tornado was sort of like the hypothetical storm you are referring too, narrow and extremely intense. 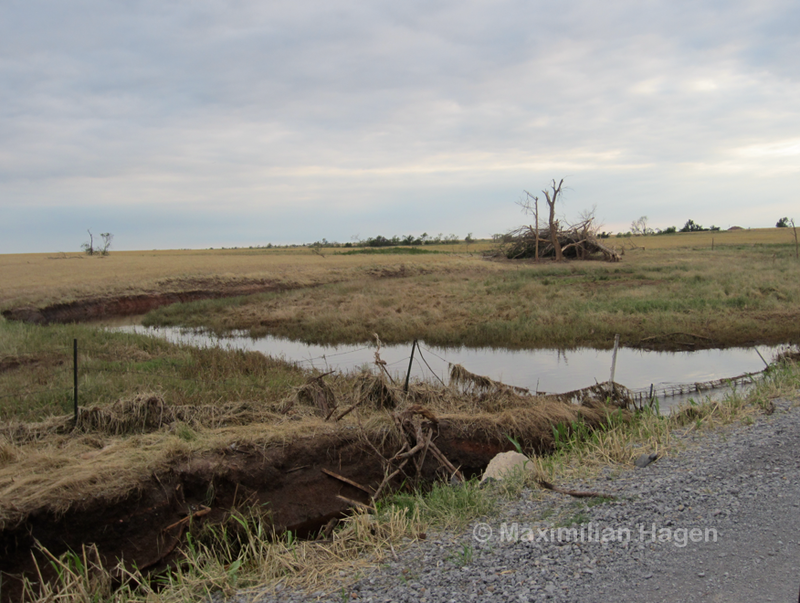 The official path width is around a quarter mile, I believe, but the swath of EF1+ damage when the extreme ground scouring occurred was less than 100 yards across. People often mistakenly believe a tornado’s size is indicative of the width of extreme damage. The Smithville tornado shattered windows over an area approximately a quarter mile wide when it ripped through town, but the EF4/EF5 damage was confined to a narrow core only 60 yards wide. In terms of intensity and how tornado winds work, are large objects (oil tanker etc) more likely to get damaged if they’re sucked into the core of a tornado versus large objects that aren’t sucked in but instead are picked up and skirted/moved outwards away from the funnel and the core? I agree that the EF-Scale totally doesn’t estimate. They passed it through (reportedly TTU) and NSSL/OU have been trying to get an Enhanced EF scale – LOL. Who did the article? Wow I thought the tornado hit was in May 3rd, 1999 tornado are only one strongest tornado in the world, but about 14 years and 4 weeks later, it is another strongest tornado in the world and the widest tornado in the history. It mean I can see now hard the 2013 El Reno tornado try to reach the 5/3/1999 tornado it mean May 31, 2013 is near to Ef-6 tornado but wind are only 296 mph, compare to May 3, 1999 tornado, 1999 tornado winds reach 318 mph so El Reno tornado is 24 mph weaker than 1999 tornado, but it lot for any tornado to reach that strong so El Reno is second strongest tornado hit in 21 century.